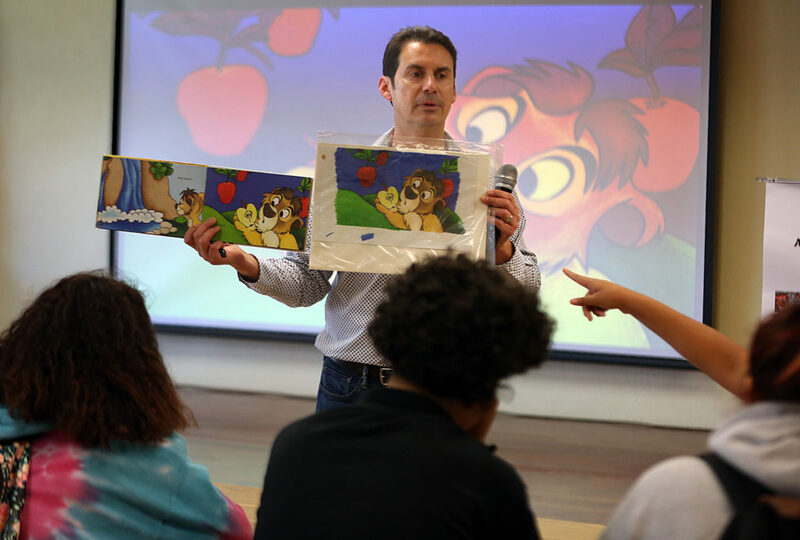 BIG CYPRESS – Ahfachkee students had a rare insider’s view of what it takes to write and illustrate books when children’s book author Andrew Toffoli spent the day April 20 demonstrating the process. Toffoli specializes in histories told through characters that slightly resemble the authentic figures, but in the guise of adorable animals. For example, Alligator Graham Bell is the story of Alexander Graham Bell, Thomoose Jefferson is the story of the third U.S. president, Lionardo Da Vinci gives the history of the renowned artist. In each book, the protagonist’s life is told starting at birth and leading up to his major accomplishments. Every grade level attended the presentations given throughout the day. Toffoli, a graphic design teacher at Miami Coral Park High School, knows how to command a room full of students and easily engaged them. 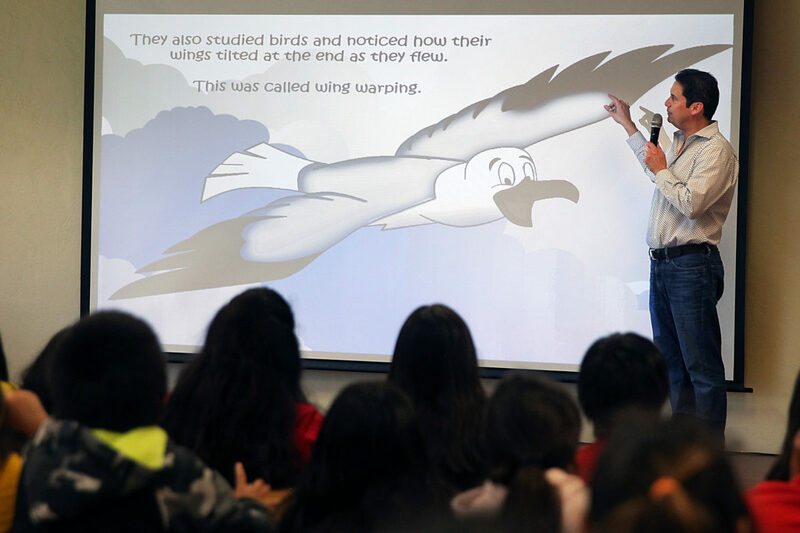 He read from his latest book about the Wright Brothers, Boarville and Wilboar, and showed the students how the illustrations evolved from pencil sketches to publication. The process of adding color to his black and white drawings takes an artist using colored pencils six months to complete. 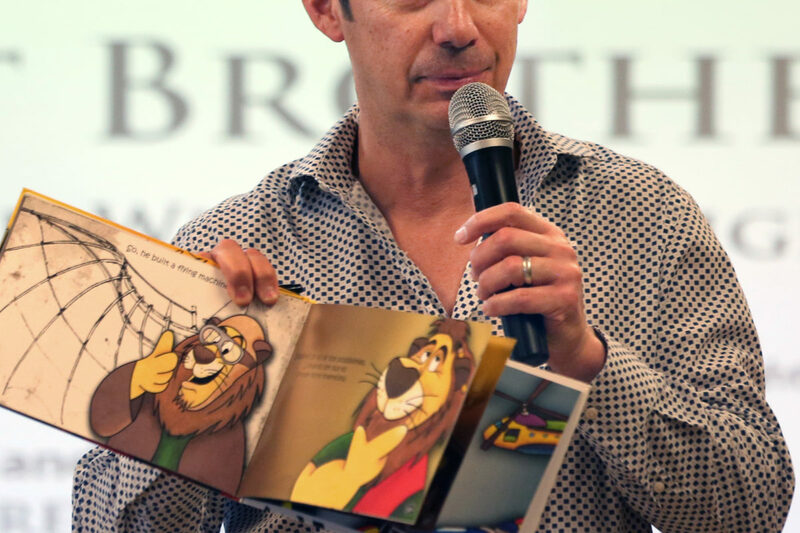 He has written and illustrated 10 books since 2004 and his next, which comes out in September, will feature his first female character; Susan Bear Anthony, the women’s rights activist and suffragette from the 19th century. 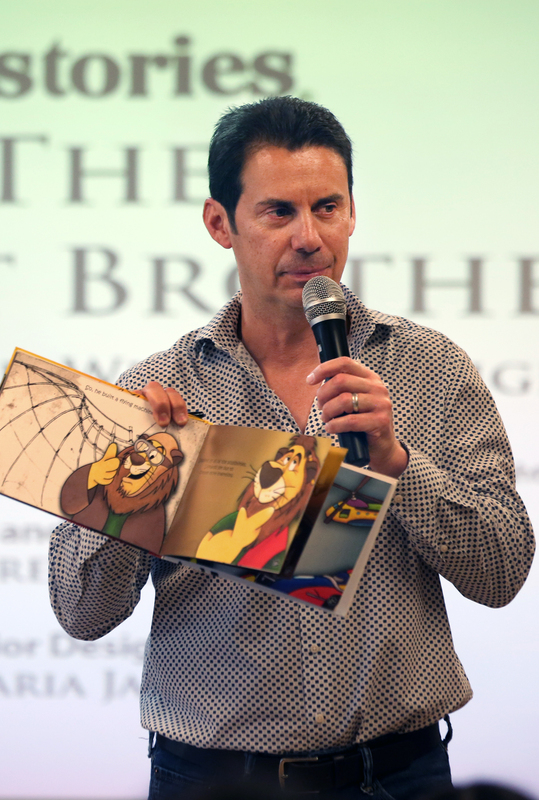 The books all start with the story, which he writes before he starts drawing. A question and answer period followed each presentation. 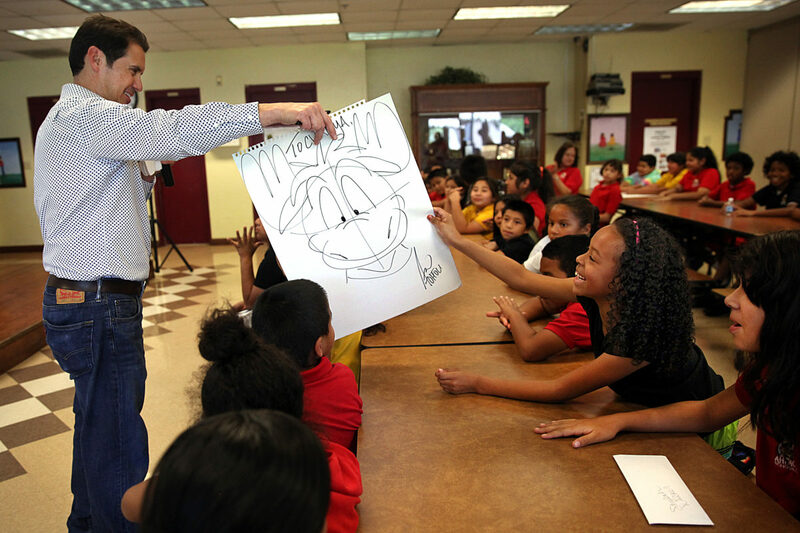 At one, Toffoli told the students he started drawing at age 6 while he watched cartoons on television. “Back then you couldn’t pause a TV, so I learned to draw really fast,” he said. One student gave a suggestion for another book: Albert Einstein. Toffoli explained he has to wait 75 years after a person passes, and the story enters the public domain, to write about him or her without paying heirs for the rights to the story. 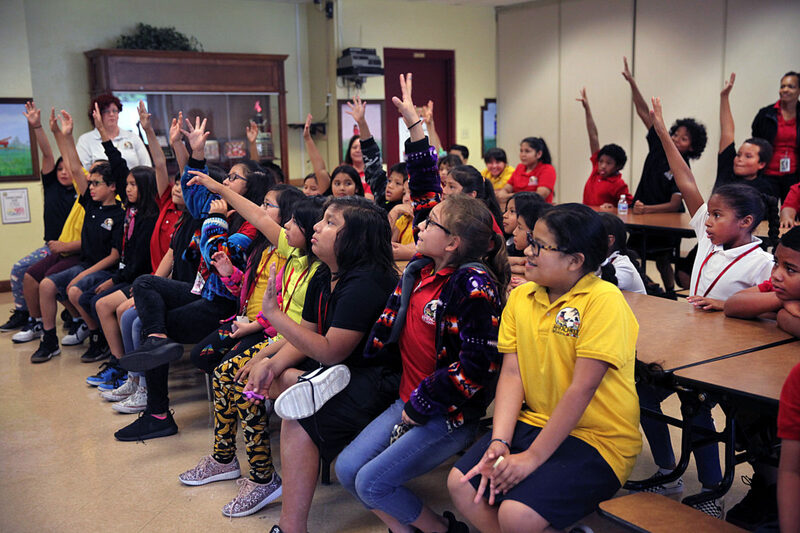 Toffoli gives about 30 to 35 school presentations each year, and said he has learned to be a better listener because of them. 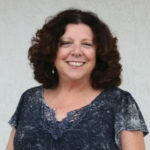 Toffoli studied graphic design at Florida State University. He was given an assignment for a book in a history of animation class and the idea of “history with animals” came to him immediately. Following the day of presentations, Toffoli met with students, parents and community members to sell and sign books. Toffoli’s books are Gullileo Galilei, Thomoose Jefferson, Alligator Graham Bell, Thomas Owlva Edison, Christopher Cowlumbus, Michelangelo Bunnyrroti, Lionardo Da Vinci, George WashingTON, Bengalman Franklin and The Wright Brothers. He plans to create books with the following characters: George Washington-Carfun, Ludpig Van Beethoven, Abrahound Lincoln, Marco Hippolo, Juan Ponce De LeBison, Bark Twain, Sir Ibis Newton, Namolean Bonaparte, Susan Bear Anthony and JoHorn Gutenberg. The books are available at Toffoli’s website littlegerm.com and amazon.com.